ARB Midstream was founded in September 2014 by Adam Bedard and Rogan McGillis along with Cortney Liddiard, CEO of founding capital partner BV Natural Resources, LLC, the energy division of Ball Ventures, LLC. ARB Midstream announced its Niobrara Connector rail terminal in November 2014, and its Permian Gateway rail terminal in May 2015. 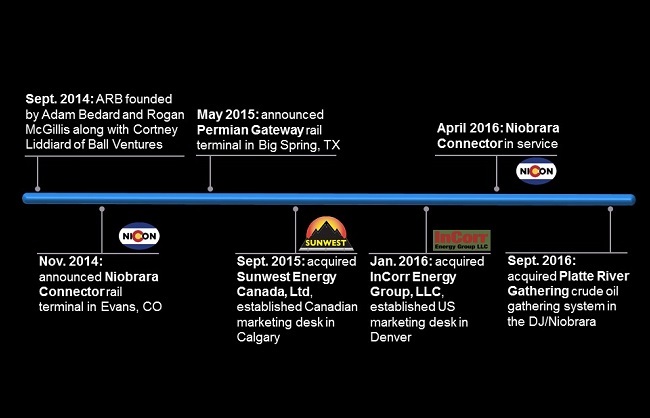 ARB established Calgary and Denver trading desks in late 2015 and early 2016, acquiring Sunwest Energy Canada, Ltd., and InCorr Energy Group, LLC. ARB placed its Niobrara Connector rail terminal in service in April 2016, and in September 2016, ARB acquired the Platte River Gathering system from Rimrock Midstream Holdings, LLC. ARB Midstream is led by a management team and Board of Directors with combined energy industry experience of over 150 years. ARB's management team has extensive energy logistics experience, including strategic planning and business development at major banks, industry-leading consulting firms and an Alerian Top 50 MLP. ARB was formed with a strategic financing relationship with BV Natural Resources, LLC, the energy division of Ball Ventures, LLC. Ball Ventures, LLC is a private company headquartered in Idaho Falls, Idaho, founded by Allen Ball, an Idaho businessman and entrepreneur that has helped build several successful companies, some of which operate in markets around the world. Under the direction of CEO Cortney Liddiard, Ball Ventures, LLC has expanded its portfolio of real estate and private equity investments, in addition to the energy division of the company. ARB Midstream is an independent, growth-oriented company, providing complete midstream and marketing solutions for crude oil, LPGs and refined products. ARB leverages the unique knowledge and depth of experience of its personnel to develop midstream assets that resolve infrastructure bottlenecks in the most profitable North American oil plays. Analyze: ARB's strategy is rooted in understanding the fundamental analytics that both predict the near- and long-term disruptions in the market, and challenge and clarify the outlook for individual projects. The company's analytics are complemented by the extensive industry experience of its leadership team. Identify: ARB uses analytics to pinpoint infrastructure bottlenecks and under-served regions that are backed by oil plays with long-term, sustainable production economics. Execute: ARB aims to be the first mover in its target markets by capitalizing on private financial backing, a lean management structure and an experienced project management team. Operate: ARB is a long-term investor, leveraging an experienced operations team to run its assets safely and efficiently, and aspires to long-term working relationships with all customers and stakeholders.